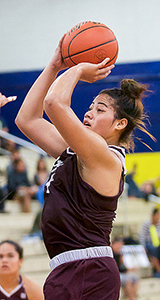 Player of the Year: Molimau Heimuli, Farrington, F/C, Sr.
Farrington's Molimau Heimuli doesn't say much in her postgame interviews, but that's OK. Her play on the court speaks volumes for her. 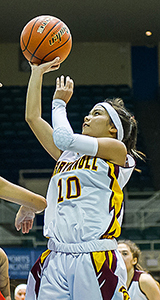 Heimuli's production and importance to the Governors, who won their eighth league title and finished fifth in the state tournament, is why she was selected as the ScoringLive All-Hawaii Division I Player of the Year, the first player to do so not named Chanelle Molina. 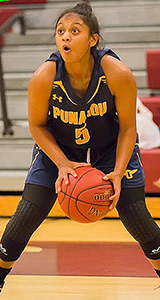 Heimuli, a 5-foot-11 senior post, possessed an exceptional array of moves in the paint that was near impossible for a single player to defend one-on-one, especially with her ability to use either hand on the low block. Even if you forced her to miss, she still had the size and skill to put back her own shot. 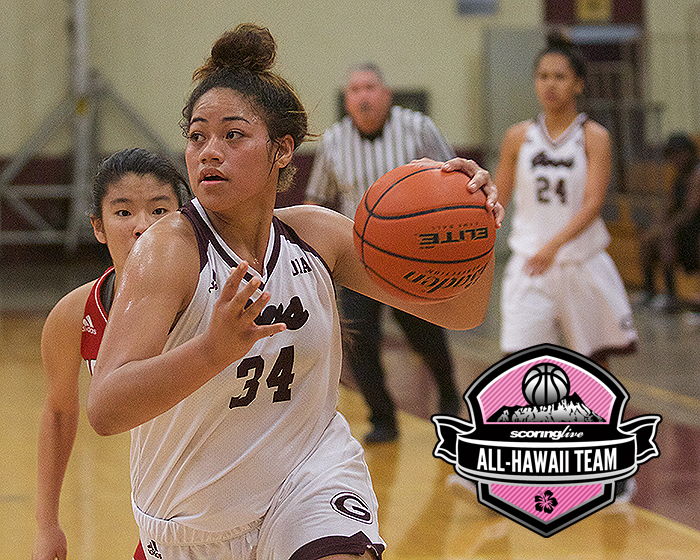 During the season Heimuli averaged 19.4 points per game and scored 20 points or more in eight different contests. 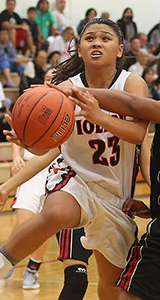 She was also a double-double machine, having averaged 10 rebounds per game during the state tournament. 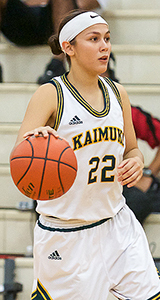 Her best performance of the season came in a 60-45 win over Kalani when she recorded 35 points with 26 rebounds. "She's a powerhouse inside the paint with exceptional footwork," said Kaiser coach Brianna Lagat Ramos. "For her size, she is physically strong, knows how to position her body for rebounds, and can always find her way to the basket." Heimuli was more than just a post player, however. She was the total package. If the paint area is clogged, Heimuli can take the ball into the midrange area and knock down an outside shot. If she grabs a defensive rebound, she can take the ball up court and run the break with precision. 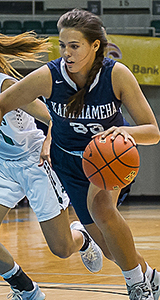 "I'm glad we don't have to defend her next year, she can be a beast," said Kamehameha coach Joe Cho. "She can handle, she can shoot it from the inside and has a good 10-footer to the free-throw line extended (jump shot). She also breaks the press really well." As Heimuli went, so did the Governors. During the Oahu Interscholastic Association season Farrington went 12-1, with the lone blemish coming in an early season 50-35 loss to Kaimuki. Heimuli was hampered with foul trouble in that contest and finished with a season-low eight points. The second meeting between the two teams was a different story. 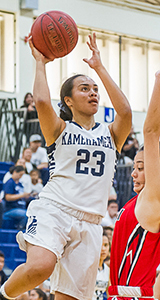 Heimuli scored 22 points with eight boards in the OIA Division I championship game to avenge the Governors' lone loss in league play, 45-37. "They don't go anywhere without her, there's no doubt she's everything for them," said Cho. "Without her, that's not the same Farrington team, and I'm sure her coach is already figuring that out." 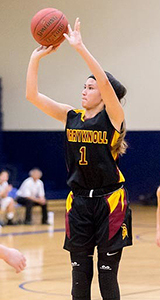 Heimuli will continue her playing career collegiately at Paris Junior College in Texas. Another year, another state championship for Konawaena. 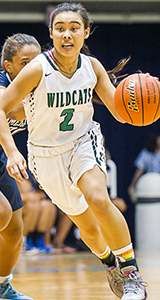 The Wildcats went undefeated against Hawaii teams to win their eighth state title and third in a row, all of which have been under the guidance of coach Bobbie Awa. The formula was a bit different this time around, however. 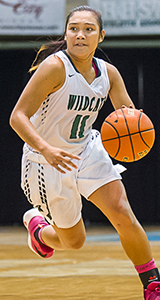 With three-time Division I Player of the Year Chanelle Molina off at Washington State University, Konawaena needed to have more of a balanced attack if it wanted to defend its crown. "They're so team oriented. I've never seen, since I've been here, a team that's so much a team," said Kamehameha coach Joe Cho. "They really do not care who scores and they really don't care who gets the credit." Even though the Wildcats utilized different sets and could play at different tempos, the team still executed as well as all Konawaena teams do. "They're so sound fundamentally," said Cho. "They all can dribble, all can shoot it and all can play defense. They just understand the game really well, and that's probably why they won three times in a row." Cho said the way Awa runs her team is something that he tries to emulate with his own squad. "The biggest compliment I can pay her is we strive to be in the ballpark of her program," Cho said. "We want to be sound offensively and defensively, to care for another and not worry about who gets the credit. What we strive for at Kamehameha is to get our program on the same level that Konawaena is on."